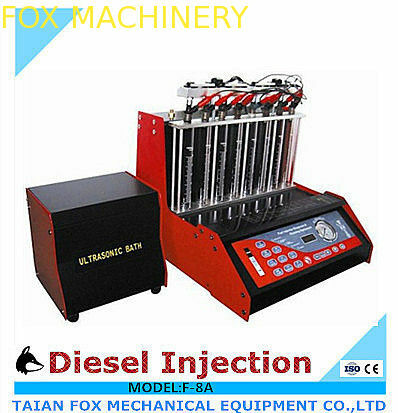 2.Automatically simulate the overall process under various pulse width and engine speed. the performance under varied parameters. Easy and convenience of operation. Resume the original state of the system. Drain back liquid to tank. Start and stop oil pump. Auto detecting and cleaning process. Full open injector and atomization observation. Press the key to start the testing process. Press the key to stop the testing process. Start signal output to injector for ultrasonic cleaning. Select different parameter to adjust. When this indicator is on, the displayer show rotation value. When this indicator is on, the displayer show pulse width value. When this indicator is on, the displayer show injection times. When this indicator is on, the displayer show total injection time. When this indicator is on, the displayer show ultrasonic cleaning time.